I haven't posted since August. That makes me feel like a huge blogging failure. When I started back in January, I thought I would at least make it through the first year without falling completely off the grid. I had a lot of reasons for the drop. I homeschool my kids, and this summer was the first time since they were very small we took the whole summer off from school. Normally we maintain a 3-4 day per week schedule, occasionally missing several days in a row to do fun things with friends. This summer, however, they were full time members of the competitive shooting team. There were out of town competitions in June and July. That meant there were still practices several nights per week and Saturdays. At the end of May I thought to myself, "You know, we could just take the summer off, and not kill ourselves." Famous last words. I spent all of August trying to get back on track. Then in September I took a part time job. I haven't "worked" since just before my oldest child was born. She just turned 14 last month. I am working at home some now, but initially I was going into the office several days a week. I was trying to cram all the other stuff, housework, grocery shopping, school, cooking, etc, into fewer hours. Something had to give, and one of the somethings was this blog. Then in early October my mother, brother, three children and I took a road trip from our home in Arkansas to see my sister and brother in law in Rhode Island. It was a wonderful, jam packed, 10 day, 3,000 mile round trip, that required about 5 days recovery! I plan to do a post all about it soon. One of the things that pushed me to blog each week were the "built in" topics that I could link to on other blogs. Most of those are thrift store/flea market/yard sale themed linky parties, and I almost always have something new to show from one of those sources. When I sat down to type this new installment, I discovered that two of the blogs have not hosted parties recently. However, Magpie Monday is up and running over at Me and My Shadow, so I will be linking up there. Fortunately, although I stopped posting about my finds, I didn't stop finding, so I have a glut of items to share! Without further adieu, or whining and excuse making, here are a few of the treasures I've found over the past few months. Vintage jewelry! I bought a little plastic bag full at a yard sale for $1, and this is what was in it. It is all very dirty, and I have only worked on cleaning the piece with the green stones. I need to read up on cleaning vintage enamel before I tackled some of it. I found this beautiful chalkware plaque for .25 at another yard sale. I love birds, and the colors on this are so lovely. At the same yard sale I found this Dansk enamel sauce pot. It's in terrific condition, and I love the color. It will probably end up in my Etsy shop eventually. I bought all of those darling little toddler shoes for a friend's daughter, but I was off by about two sizes, so they might find their way to the resale shop. I just can't pass up Converse, no matter the size. The saddle oxfords are for my vintage loving 14 year old. She was thrilled to see them. I have a variety of vintage Christmas items that I will be adding to my Etsy shop soon. I hope to blog about them and link up next week. My sister lives in Rhode Island. She's not a thrifter or yard saler. I know, it confuses me, too. 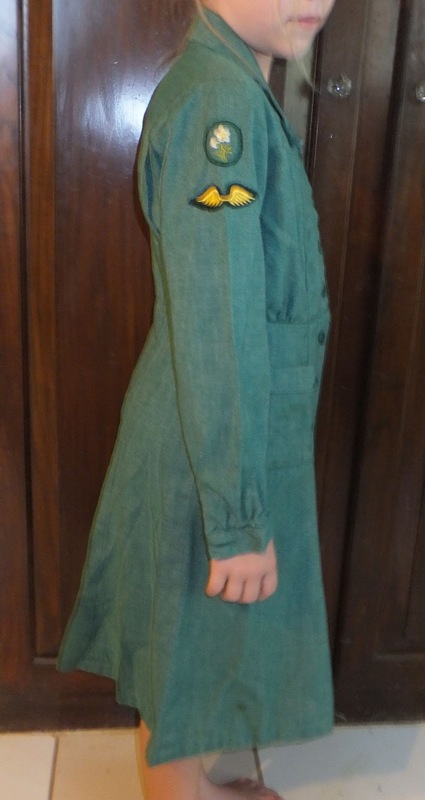 Anyway, she recently scored a large lot of vintage Girl Scout stuff and sent it to me to put in my Etsy shop. I have been dragging my feet because I was unsure how to list it. All together for one price? Each piece individually? Some of both? I decided some of both was the way to go, so I am working on getting all of what you will see in this post in the Etsy shop. In the meantime, I'll share it with you. 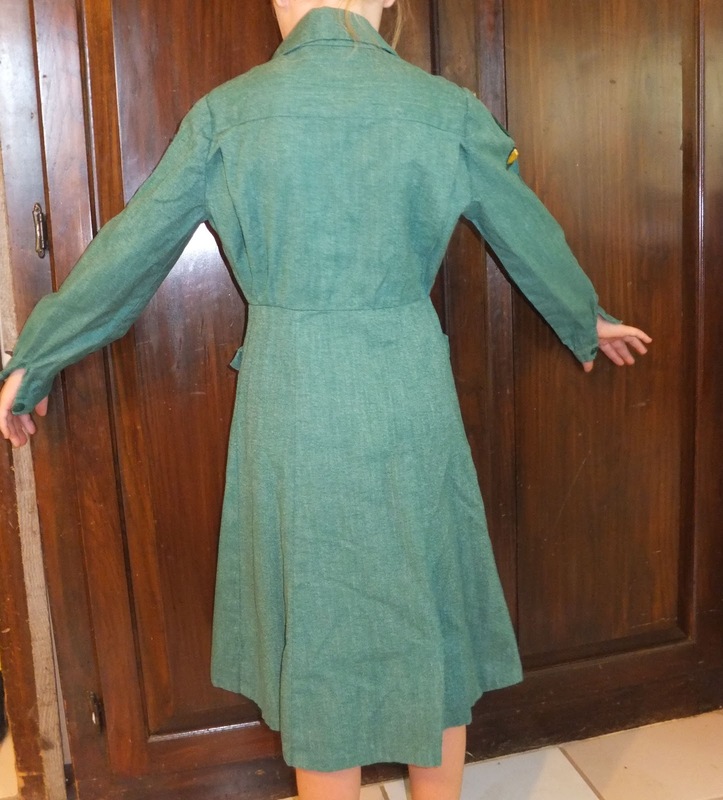 First, we have this Girl Scout uniform dress, probably from the 1950's. That's actually Bekah, my 8 year old, modeling the dress. 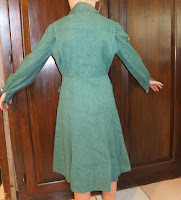 I would guess this dress was worn by a much older girl back in the 1950's, but it almost fits her, so I would estimate it at a modern size girls 10. The dress is in remarkably good shape for it's age. It has two very small spots, but otherwise is wonderful. There were also a bunch of patches and pins. And this adorable collapsible aluminum cup. 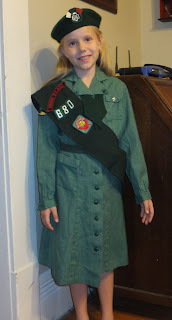 Speaking of too cute, here is Bekah in the dress, belt, sash, beret, and necktie. I can't believe the Girl Scouts gave up the beret. I'm linking up with Coloradolady for Vintage Thingie Thursday and Her Library Adventure for Flea Market Finds. Ok, I realize that I should have titled my last post "Yard Sale Haul: Part 1" rather than "Vintage Toys: Part 1", but I was so starry eyed over the Barbie furniture that I got confused. As I mentioned in that post, my finds last week were so uncharacteristically numerous that I couldn't fit them all in one post without risking putting readers into a trance. If you read this post, you know that Bekah has a humongous dollhouse. It is too big for any normal table, so I had been on the lookout for one of these upon which to rest it. I had put a train table on my mental list, and within two weeks, there it was. I paid $10 for it, and the dollhouse is already atop it, looking great. (in truth, even at 3ft x 4ft it's still a bit small for the house, but is an improvement over what we had.) It has two large drawers underneath to hold her extra furniture. Books were another big find last week. I sort of collect vintage children's books. I say sort of because it's not an official collection, I'm just captivated by their illustrations. Look at that book in the lower left, Pockets. Have you ever seen anything cuter?? Not all of the books I bought were vintage. With three voracious readers in the house, I rarely pass up good books. Rachel has read many of these before, but I pick them up again for Joshua and Bekah. I'll wrap up part 2 with these darling vintage children's book and record sets. The taller black and yellow ones in the back came with a filmstrip!!! A filmstrip I tell ya! Just like the old kids' books, these book and record sets often have the most adorable images on them. Most of these will be in my Etsy shop soon, so if you have a favorite you can get it there. Check back in the next few days for part 3. There are more toys and some odds and ends. Did you find any vintage goodies, or just anything good for cheap, last week? Share in the comments. I went to a few yard sales this weekend. Normally I try to include photos of everything I got over the course of one week in my Sunday night post. I can usually cram all of it into 4 or 5 photos. Throw in a few close ups, and my thrifting/yard saling posts usually have about a half dozen pics. This week I needed 11 group pics to get it all in. That does not include the close up shots. ELEVEN! Let's just say I got a shocking amount of stuff this weekend. As a result, I have decided to break it up into several posts over the course of the week, and just focus tonight on one aspect of my finds. Check back over the next few days if you'd like to see the entire haul. I had a strange experience on Saturday. I returned to the same yard sale three times. I know. It was very close to my house, almost close enough to walk to. I stopped the first time and bought several vintage toys and other items. However, I left some things behind that I was on the fence about. It was several early 80's original Cabbage Patch Kids and a ton of their clothes. When I got home I mentioned them to Rachel, and she agreed that I should go back and get them (hehehe). When I got back to the sale, only about 20 minutes had elapsed, but during that time someone else had swooped in and bought them. Remember rule number one in bargain hunting: You snooze, you lose. Anyway, on this second trip back I spotted something even better that had not been there before. The man having the sale told me he was still bringing stuff out, and would be for several hours. That led to the need for a third trip about an hour later. Is that vintage inflatable Barbie furniture??! You'd better believe it! And who is that lovely gal seated on the blow up chair? Oh, it's Barbie's little sister, Skipper. She's straight out of 1970, and looking great. Ah, Barbie (1966) and Ken (1968) relaxing on the Dream Furniture from 1978. The tables are missing their mirrored (mylar) tops, but they are still really fun. That desk intrigues me. I don't recall anything like it from the late 70's, real or toy. Very futuristic. The box contained many more treasures, including another Barbie and Ken, and a bunch of replacement pieces for the Barbie Star Traveler RV. Those might show up in one of the later posts, and they will be available in my Etsy shop soon. Yes, that's my smallest chick, fresh from her pre-bedtime shower, resuming the activity that she had been engaged in since the big cardboard box entered the house before lunch. She knows they are not "hers", and that they are not staying forever, but she is enjoying them for now, so any Etsy buyers anxious to relive their 1970's childhood will have to wait a bit. A 21st century kid is busy with them right now. No snappy title. My brain is tired. It's a good thing I took some pics of these beauties on the day I bought them, or this post probably wouldn't happen. If someone has some extra energy to spare, send it my way. I went yard saling with my mom on Thursday. Craigslist told us that there was an estate sale a few miles away, so that was our starting point. It was pretty good. I got a lid that I was missing for a Pyrex casserole for 50 cents. There was a table full of jewelry, and the prices were very reasonable. Rachel and I both love vintage brooches and clip on earrings. Later we made our way to a sale that had been advertised on CL for over a week. It listed some guns, which interested me for the kids shooting sports club, but those were all gone. What was left was some darling pins. I think most of them qualify as vintage. A few will end up in my Etsy shop, but most will live with me and my girls. About half of this came from each sale. The little knife was a bonus find for Joshua. My grand total was around $8. Here's a close up of some of the pins. That little blue bird is just too cute. His tummy is a shiny stone. He reminds me of the old Lefton china wall hangings. My Gramma had some pink fish in her bathroom. I'm a big fan of enamel jewelry, so I didn't hesitate to buy the blue flower. The tiny gold one above the crown is the space shuttle. We are huge NASA geeks, so I knew everyone in my family would be excited about that one. Let's take a look at some of the Christmas pins and the earrings, shall we? That Christmas tree pin is too beautiful for words. The picture just doesn't do it justice. The little jewels are a lovely blue-green, and when the pin is upright they hang down. It will definitely make some appearances this Christmas season. The little snowman and bells remind me of the type I had when I was a kid. I haven't tried to track down any information on them yet. You might notice that I mentioned clip on earrings, and none of those are. I rarely wear pierced earrings, and Rachel's ears are not yet pierced, but I liked all of these too much to pass up. The pink and black dangly ones are very lightweight, so I should be able to wear them. The set with the blue stones is lovely, and I will probably hang on to them. Well, that wraps up the jewelry show for this week. I will be linking up with several linky parties, so click the links below to see what you can find. I have spent a fair amount of time yard saling the past few weekends. The fabulous finds have been a bit hard to come by, but it's been fun. This past weekend I stopped by a Thursday yard sale and discovered it was two elderly sisters who were selling their recently deceased mother's belongings. Some folks find that macabre, but I just see it as the natural progression. And in this case, the sisters didn't think their mother's stuff was much better than junk, but for a vintage-phile like myself, it was exciting. A lot of the items had been packed away for decades. Normally that leads to untold treasure. Unfortunately, the bulk of the items had been stored in cardboard boxes. Folks, don't store things you love in cardboard boxes. The moisture will ruin your stuff. This yard sale had dozens and dozens of old books, all damp and mildew covered. Quite a sad sight. There was also a metal science kit that still had many of the dangerous chemicals that used to be included with science kits for older teens. I would have loved to have that for homeschool, and Husband is well equipped to determine the usability of the chemicals, but the metal case had been allowed to rust badly, and most of the lids to the bottles were rusted, so it was just trash. However, among the trash there were some gems. This old fiberglass chair is a much prettier shade of turquoise than it appears in this photo. It had several things piled on it, and when I asked how much it was the seller looked like she couldn't believe someone wanted it. She said, "Fifty cents, and the dirt is free." It was covered in a layer of dust/dirt. I told her I'd take it, and moved it up near the cash table. Later I heard another shopper ask about it, and the seller told her I was buying it. I also found that cute piece of vintage advertising that you see on the chair. Isn't that darling? It says Story Road Drive-In Dairy. The thermometer works, and on the back is a calendar from 1962! That will probably end up in my Etsy shop eventually. You might be wondering about that questionable looking box behind the advertising piece. I agree that it looks like something not everyone would want to pick up. But I'm not everyone. And I'm happy about that, because it did lead to a little treasure. Did you hear that squeal? That was me and Rachel expressing our delight at these lovely vintage cards. They are in very good condition, and we plan to use them as they were intended to be used. So if you know us, and you get married in the near future, that beautiful 1950's bride might appear in your mailbox. As I was heading to my car with my finds, the other shopper who had asked about the chair approached me. She said, "That chair is really great. I'll give you $15 for it." I told her thank you, but no, I was going to keep the chair. She said, "Twenty." I laughed and assured her that I was not trying to drive the price up. I told her my daughter was really going to like the chair, and I wanted to keep it. She was disappointed, but friendly. I guess she had been hanging around, waiting to see if I really bought it, and to offer me more. Vintage-philes like what they like. I'm linking up with Me and My Shadow for Magpie Monday and Her Library Adventures for Flea Market Finds. Go check out the goodies. 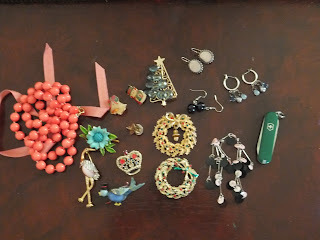 Due to a busy schedule, my link up with Coloradolady for Vintage Thingie Thursday is a bit of a cheat. A few months ago I made a post about a vintage light that I was hoping to identify. 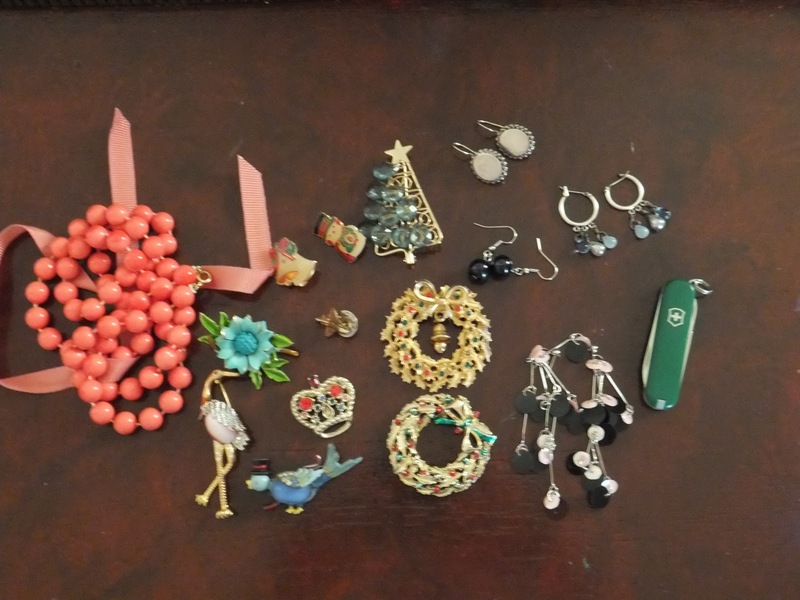 It is still unclear how old it is or what its value might be, so if you are visiting from Vintage Thingie Thursday, or even if you're not, please read this post and let me know if you can help. I’m wife to a wonderful elected official who shall remain nameless, until I forget and name him, stay at home/homeschooling mom to three great kids, Rachel 14, Joshua 12, and Rebekah (Bekah), 8. I’m a political junky, mid century modern fan, and thrift store expert. I strive to live a life that glorifies God, but I fail on a daily basis, always grateful for grace. I blog about life, kids, homeschool, politics, and great finds. Thanks for joining me.